Soon after Clifford Jack, Mayo Clinic, Rochester, Minnesota, proposed a hypothetical model showing biomarkers emerging at different stages of Alzheimer’s disease (AD), his diagram surged to the top of the Most-Popular-Slide-at-Conferences chart. All the same, scientists have been wondering how well the model will hold up. Several researchers, including Jack himself, recommended updates at the 7th Annual Human Amyloid Imaging meeting held 16-18 January in Miami, Florida. Reflecting some of the latest data on biomarkers in Alzheimer’s disease, their tweaks aim to more accurately represent the disease cascade. Jack and colleagues published their original model in 2010 (see Jack et al., 2010, and ARF Webinar). It temporally ordered five main markers of AD. Jack proposed that Aβ changes occur first, followed by tau, alterations in brain structure, memory loss, and finally, clinical impairment. He depicted these as parallel sigmoidal curves, where biomarker change happened first rapidly, then more slowly as disease progressed (see image below). As longitudinal studies begin to map the biomarker landscape more thoroughly, the model was bound to change. At HAI, for example, Victor Villemagne and Christopher Rowe from the University of Melbourne, Australia, gave an update on the Australian Imaging, Biomarkers and Lifestyle (AIBL) study. They suggested that amyloid accumulates not just long before symptoms, but also long before changes in other biomarkers. They derived rates of Aβ accumulation for almost 200 research volunteers in AIBL who had at least three amyloid scans over three years. Some had five scans over six years. Extrapolating that rate backwards, they estimated that it took an average of 12 years to build up enough Aβ for a positive scan, and a further 19 years to reach levels seen in AD. Biomarkers such as hippocampal atrophy, gray matter shrinkage, and worsening memory appeared only about seven years before dementia onset, Rowe said. Jack showed recent data from the Mayo Clinic Study of Aging that suggests PET scans detect amyloid before FDG-PET shows irregularities in brain function or before the hippocampus shrinks measurably. Jack and colleagues conducted two or more serial PET scans, about every 16 months on average, in 213 cognitively normal adults aged 70-90 with the amyloid tracer Pittsburgh compound B (PIB). People who were initially amyloid negative turned positive at a rate of about 13 percent per year, and did so while FDG-PET and hippocampal volume stayed stable. How do emerging data fit with the model? Jack presented a revision that will be published in the February Lancet Neurology, already available online (see Jack et al., 2013). In this version, Jack marks time—rather than disease stage—along the X axis. Why this change? It allows for person-to-person variability, said Jack. The clinical manifestation of AD pathology can differ among people with similar biomarker profiles. Cognitive impairment now appears as its own curve—or swath, to be precise. Jack and colleagues represent impairment as a green zone bounded by two lines: one to the left representing high risk of manifesting clinical symptoms with a given biomarker profile and one to the right representing a lower risk of manifesting clinical symptoms with the same biomarker profile (see image below). Risk factors such as genetics, lifestyle, cognitive reserve, and comorbid pathology influence where a person would fall within that zone at a given point in time. The updated model is different in other ways, too. Though Aβ biomarkers are still first to change, Jack and colleagues now separate out CSF Aβ and brain Aβ, with the former changing first. The group also combined 18F-fluorodeoxyglucose (FDG) PET and MRI into one curve where the previous diagram had not included FDG-PET. 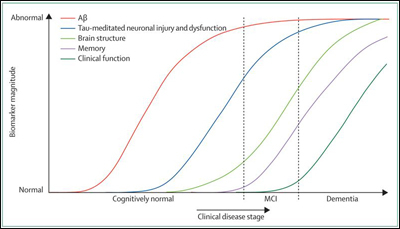 All markers are still represented as sigmoidal curves; however, the biomarkers that emerge later now sport a steeper final slope because their rate of change plateaus less in the dementia stages of disease. Additionally, the distance between the lines reflects how certain markers track closer together temporally. “The model is getting closer to what we find in our data,” said Rowe. Updating the staging model is important to inform trial design in presymptomatic AD. It could help pinpoint particular time points in AD progression, determine how long trials should run, and indicate which biomarkers to track in clinical trials, he said. At the end of his talk, Jack introduced an additional twist, which he called the "integrative model." The graph looks the same as the updated version, but reflects autopsy data showing that tau pathology appears in the brains of most middle-aged people, almost always before Aβ markers change (see Braak and Del Tredici, 2011). Current CSF analysis does not detect this kind of tau pathology, as represented by a gray bar at the bottom of the plot. Here, tau changes before Aβ, but the latter changes faster and is detectable first in the CSF. Researchers at HAI were grappling with these ideas. They wanted to know what this new model means for the pathophysiology of AD, given that many in the field have been working on the premise that Aβ pathology comes first and, indeed, precipitates tau pathology. It could be that tau deposits are a natural part of aging, Jack responded. Aβ builds up later and independently, progresses quickly, and drives tau out into the neocortex to initiate a neurodegenerative cascade. Researchers first proposed this idea over a decade ago (see Price and Morris, 1999), but the imaging community was relatively slow to pick up the idea, said Jack. Over the years, John Morris, Washington University, St. Louis, Missouri, has repeatedly spoken about the presence of neurofibrillary tangle pathology in most people as they age, and its precipitation into Alzheimer’s once amyloid pathology arises separately (e.g., see ARF interview). While the data gave average buildup rates, people differed in their individual pace, however, and faster aggregation correlated with faster memory decline. “Even in the fastest accumulators, it looks like it still takes at least 10 years to increase from a barely positive scan to typical AD amyloid levels," Rowe said. Researchers in the Dominantly Inherited Alzheimer Network (DIAN) and the Alzheimer's Prevention Initiative find a similar two-decade Aβ buildup in early onset, familial AD carriers (see ARF related news story). Susan Landau, University of California, Berkeley, questioned one other piece of the Jack model. She hinted that a drop in CSF Aβ does not always foreshadow brain Aβ deposition. She and colleagues examined cross-sectional data on CSF Aβ and amyloid PET with florbetapir for 374 people classified as cognitively normal, MCI, or AD in the Alzheimer's Disease Neuroimaging Initiative (ADNI). CSF and PET measures agreed as expected 80-90 percent of the time. In 20 people (three normal controls, 12 with early MCI, four with late MCI, and one with AD), however, they did not. What explains the discordance? If CSF Aβ typically dips before amyloid deposits form in the brain, as previous data suggest (see Fagan et al., 2009), then low CSF Aβ and negative amyloid PET might occur at the same timepoint, especially in early disease stages, argued Landau. Surprisingly, she found the opposite. Among those 20 people, 13 who were either cognitively healthy or had early mild cognitive impairment (MCI) turned out to have normal CSF Aβ, yet tested positive for florbetapir. On the other hand, most of those with low CSF Aβ and normal brain scans had been diagnosed with late MCI or AD. The data go against conventional thinking and support the idea that CSF Aβ and amyloid PET measure different forms of the protein, so are not always interchangeable. “While a sample size of 20 is too small to make firm conclusions, the data hint that florbetapir might become abnormal first in some cases,” Landau said. It is also possible that the seven people with normal scans but low CSF Aβ, most of whom were diagnosed with later-stage disease, may have had another disorder, said Landau. William Jagust, University of California, Berkeley, pointed out that a high proportion of those with low CSF Aβ yet no brain amyloid were ApoE4 negative. He wondered if there might be something about florbetapir binding to amyloid that is different between ApoE4 non-carriers and carriers. That is possible, said Reisa Sperling, Brigham and Women's Hospital, Boston, Massachusetts, who saw amyloid-negative ApoE4 non-carriers in the recent bapineuzumab Phase 3 trial (see ARF related news story). “It may be that the fundamental biology of amyloid deposition is a bit different in ApoE4 carriers—they accumulate more overall,” she said. It could also be that ApoE4 carriers have more vascular amyloid burden, which binds PIB easily, she noted.—Gwyneth Dickey Zakaib. Braak H, Del Tredici K. The pathological process underlying Alzheimer's disease in individuals under thirty. Acta Neuropathol. 2011 Feb;121(2):171-81. PubMed. Risacher SL, Saykin AJ. Neuroimaging and other biomarkers for Alzheimer's disease: the changing landscape of early detection. Annu Rev Clin Psychol. 2013 Mar 28;9:621-48. PubMed.